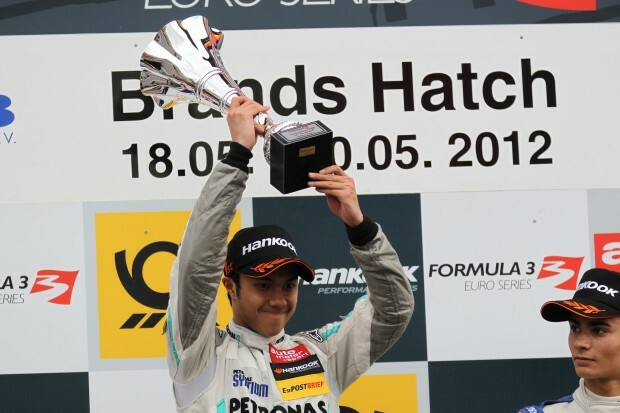 Jazeman is enjoying a podium-rich season of racing this year and this weekend celebrated his first F3 Euro Series win at Brands Hatch, UK, just one week after taking his first British F3 victory, in Pau, France. Jazeman’s win was a lights to flag victory for the young Malaysian, with the PETRONAS-supported driver starting from pole and fending off the chasing pack to take the chequered flag first. For the second weekend in succession the proud Malaysian stood on the top step of the podium with his nation’s flag flying above and the Malaysian national anthem, Negaraku, playing to celebrate his success. Jazeman competed at Brands Hatch as a guest driver, taking the opportunity to join the F3 Euro Series weekend to build race experience and race on a track layout new to him. With 11th quickest lap in the pre-event test on Friday, Jazeman improved to post seventh fastest time in the qualifying session to take this position for the third race. His second quickest lap time put him 10th for the first race grid. 19-year-old Jazeman had a competitive opening race on the short Indy layout at Brands Hatch. He quickly settled into a strong pace and was pushing hard each lap. An eighth place finish was a welcome reward for the Malaysian youngster. A semi-reverse grid for the second race put Jazeman in pole position and the pressure on his shoulders to lead the race from the off. He executed the perfect start to defend from Felix Rosenqvist into the first corner, never giving an inch as they raced through Paddock Hill Bend and up to Druids, emerging in the front and staying there for the duration of the race. Despite numerous attempts by his rivals to wrest the lead from him Jazeman showed maturity and confidence as he kept his head and stayed ahead to take his first F3 Euro Series win and the first by a Malaysian driver. The final race of the weekend was a turn of fortunes for Jazeman. Lining up in seventh he made a strong start, but a charging Sven Muller made an over-ambitious overtaking manoeuvre at Graham Hill Bend on the opening lap, which dropped both drivers to the back of the field. With Jazeman ahead of Muller he was defending hard to maintain position, but another attack from Muller later in the race resulted in the inevitable tangle with Jazeman suffering steering damage, forcing him to retire to the pits. Jazeman’s busy season continues with a quick trip to Monaco next weekend as part of PETRONAS Talent Programme for the Formula 1 Monaco Grand Prix, where he will be in the pits with the Mercedes AMG PETRONAS Formula One team. The following week he will travel to Red Bull Ring in Austria, for his second ‘guest driver’ appearance in the F3 Euro Series.